I've recently been using Honey & Oat Conditioner from Toni & Guy's Label M brand. Haircare is one area of beauty that I spend a lot of my own money on. I've really struggled with my hair in the past. As a result, I have become very fussy when it comes to haircare and incredibly brand loyal (I swear by La Biosthetique shampoo) so I tend to pass samples I receive onto friends and family who review on my behalf. Having said this, I truly believe that it's the shampoo you use which makes a difference so I'm open to trying other brands of conditioner, hair treatments and the like, hence today's review. Although familiar with the Label M name, I can only remember trying one other product from the brand and that was the Blow Out Spray which I really didn't like. So, what did I make of Label M Honey & Oat Conditioner? Upon first impressions, I really liked the sleek packaging with the signature, monochrome branding of Label M adding a professional feel to the product. The only annoying aspect is that it's difficult to tell how much product is remaining as the bottle isn't transparent. The flip top lid means that it's functional to use. Although designed to treat dry, dehydrated hair, Label M Honey & Oat Conditioner isn't heavy and I haven't found that my fine hair has been weighed down. I found the lightweight formula easy to work through my hair and I liked that it was quick to rinse out completely. It has an overwhelmingly sweet honey fragrance but this doesn't linger once hair is dry. I liked the idea that it contains an "exclusive Enviroshield Complex" to protect hair from heat styling and UV rays, although I find it very difficult to comment on the effectiveness of this. The bottle is a generous 300ml and as a little goes a long way, it'll last for months even if, like me, you wash your hair daily. At £14.25, I feel that it is a fair price. 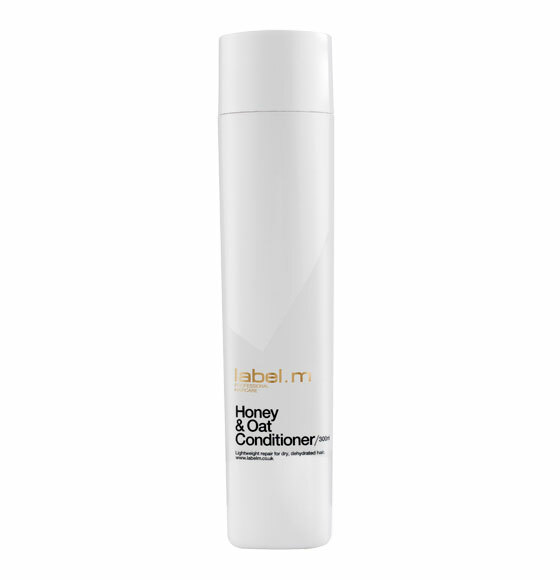 Overall, I liked Label M Honey & Oat Conditioner and feel that it delivered on its promises. Personally, I wasn't wowed by it and for that reason, (bearing in mind how fussy I am with haircare) I probably wouldn't repurchase but I would recommend trying it. © SKIN DEEP | All rights reserved.